This one turned out super cute. I love the little boy bunny in a super hero costume. Since I hand stitched all the animals in theses animal series using felt. The carrot has a zipper. There is one more set to the series, baking bears in a cupcake. That is the hardest one and that’s why I haven’t finished it yet. Maybe one day I’ll get around to it. If you made something inspired by Simply Modern Mom, please upload pictures of it in our Flickr group to show it off to everyone. You may be featured on Simply Modern Mom. Thanks, my Kaye loves playing with them. so…..how do I get my hands on these? or the pattern! gina501@hotmail.com thanks! Do you have patterns to any of your Animal Series? They are too cute! they were from a book called scrap savers. I will look for it! Thanks! That turned out so cute! I have been working on that same project for over a year and can’t seem to get it done. All the tiny stitches, I keep putting it down!! So awesome to see one done! I grew up playing with a set exactly like this! Love it! The bunnies are so cute too! 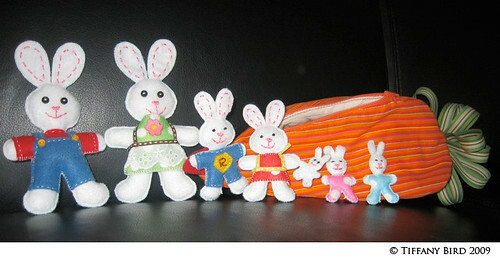 I made a set of very similar bunnies for my daughter for Easter. She absolutely loves playing with them. My grandma made me this set when I was a kid! Got to track those down for my son…Thanks for the great memory!